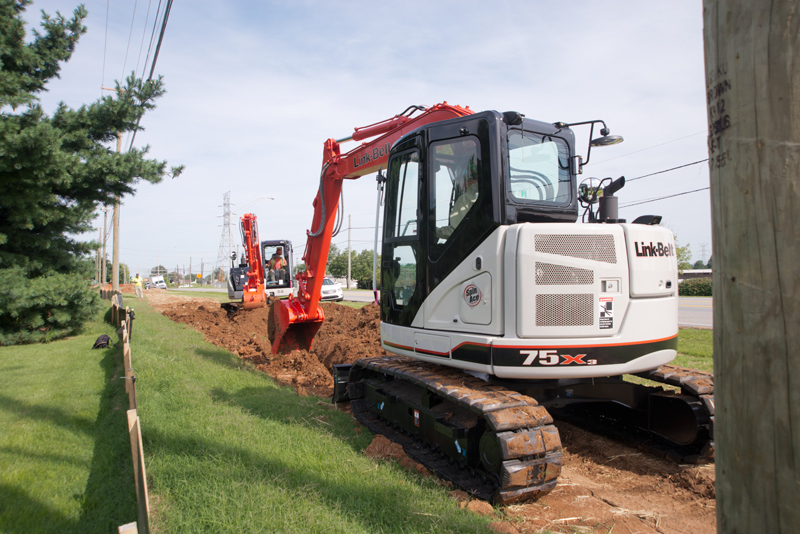 The new Link-Belt 75 X3 and Link-Belt 80 X3 Spin Ace Excavators are now available for the US and for Canada. 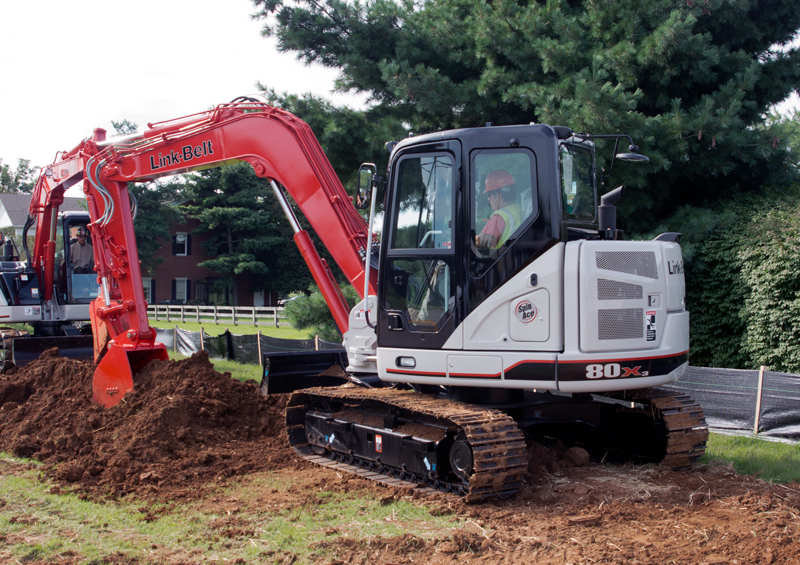 These new models replace the popular 75 and 80 Spin Ace minimum swing radius excavators. New features include a Final Tier 4b Isuzu engine with up to 5% better fuel efficiency, a larger ROPS-certified cab with new interior and a 7-inch color monitor, up to 5% more lift capacity, up to 7% faster cycle times and improved serviceability. Both machines can be equipped with a multitude of optional auxiliary hydraulic systems now with proportional controls allowing for greater controllability on the jobsite. The 75 X3 and 80 X3 are both equipped with an advanced, electronically-controlled Isuzu diesel engine to deliver unparalleled performance and power to respond to peak demands of heavy digging and lifting applications, especially in tight work areas. This advanced engine is EPA certified to Final Tier 4b standards utilizing cooled exhaust gas recirculation (CEGR) and diesel oxidation catalyst technology (DOC). Both machines feature an all new Fuel Management System to squeeze every ounce of power from every drop of fuel. Technological advancements in engine electronics and enhancements to the hydraulic system have helped reduce fuel consumption by up to 5%. In combination with additional engine controls such as Auto-Idle, the advanced Fuel Management System lowers overall owning & operating costs like never before. With a high-pressure common-rail fuel injection system, there’s no wasted fuel with precision, electronically-controlled metering. The X3 Spin Ace excavators cab is 8% larger and more expansive with enhanced visibility to the right side without blocking the view to the travel motors. With a large, 7-inch LED color monitor to interface with the machine, an operator can easily navigate a full menu of user-friendly controls to take full command of the excavator. An operator will also feel safer in the ROPS-certified cab, especially with the standard rear-view camera which displays a panoramic view of the worksite from the rear of the machine. Other notable new cab features include: a Fuel Consumption Gauge on the monitor to assist in determining operating characteristics; newly designed joysticks with single-swipe wiper function and radio mute buttons; new MP3 audio input, improved air-flow of Climate Control A/C and heat; and a repositioned fuse box for easy access. And, all Link-Belt excavators are equipped with a standard control pattern changer so every operator can feel right at home in an X3. Both the 75 X3 and 80 X3 come equipped with a 7’ 7” hydraulically controlled dozer blade as standard equipment to make backfilling quick and easy. Refinements to the X3 Series hydraulic system have resulted in gains in lift capacity up to 15% and up to 7% faster cycle times. Many of the innovative hydraulic features of generation’s past have been carried through to the new X3, including the smooth functionality of the open-center design. At the end of the day, it’s better performance, more productivity…more work for less money! To maximize uptime, the 75 X3 and 80 X3 feature an on-board diagnostic system with flashing diagnostic codes on the monitor to quickly alert the operator to potential trouble. New, programmable, service interval reminders for 13 different service items can be tracked through the monitor to make planning maintenance easier. A new easy access cab filter on the left hand side of the cab provides ground level access while helping maintain cab pressure to keep the interior clean. Combined with the remote mounted filters and ground-level access carried over from the previous models, this new generation of Link-Belt excavators will be the easiest to service ever. The 75 X3 Spin Ace Excavator comes standard with a straight boom with the option for an offset boom configuration. This setup allows the operator to adjust the attachment position to work from side-to-side, taking full advantage of this machine’s ability to maneuver in tight spaces such as digging right up against building foundations. The 80 X3 Spin Ace Excavator comes standard with a swing boom attachment that can rotate 130-degrees from left to right. This unique design allows the operator to dig around a corner in tight areas and also allows for digging right up against building foundations.